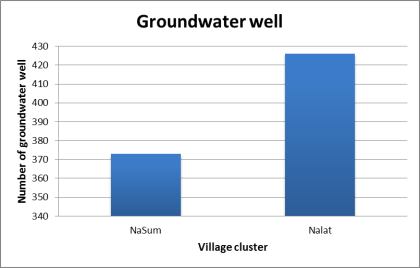 Two type of groundwater well were recorded in village clusters. The figure below actually presents the number of groundwater well which included both boreholes and shallow wells. Nalat shows 426 wells. Beside groundwater exploration, villages also use water from the small river or steams nearby. It is assumed that the large quantity of water consumption in Nalat would be greater than Naxam. 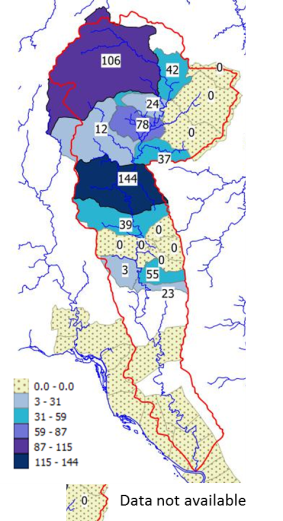 According to the daily water consumption, there is the potential that water quantity will not be enough in Hinherb and Sangthong districts in the future. The current quantity and quality of groundwater are said to be in good condition. However, water in boreholes may dry part of the year and white sediment appeared in shallow well. The groundwater sources are generally not protected nor by the users nor by the authorities.